Each year Winexpert produces only a limited quantity of five fabulous and unique varieties from around the world from January through April. These very special wines are only available during their month of release and are so immensely popular that they can be acquired by pre-order only. 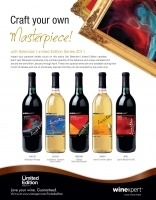 Winexpert's Limited Editions consistently win medals at various amateur wine making competitions and continue to be a highly sought-after offering, which speaks to the high quality wines that these very special wine kits produce. To ensure you don't miss out on this year's five hand-selected varietals be sure to pre-order withThe Vineyard by December 5, 2011. To find out all about this years varieties, go to www.winexpert.com/limitededition.